I've been hearing all the recent buzz about Illamasqua's Sophie-I, an eye look specially created by Illamasqua for their S.O.P.H.I.E charity initiative. This time, they're partnering with one of the most awesomest nail bloggers on the planet, Scrangie, to raise awareness of S.O.P.H.I.E. ("Stamp Out Prejudice Hatred and Intolerance Everywhere"), named for Sophie Lancaster, a British girl who was beaten to death together with her boyfriend for looking different. I'm always very supportive of S.O.P.H.I.E. 's cause. The effects of prejudice, intolerance and hatred are more commonplace than ever these days, especially now the internet has opened new aveneues of cyber-bullying, which wouldn't have been available just over two decades ago. Who would have thought that with the advent of the internet, kids would bully other kids til they were driven to the point of suicide? As a blogger (and on occasion also subject to fortunately much milder forms of online bullying as a result - you know, mean tweets, comments, etc), this deeply resonates with me. To make this look, I didn't use any Illamasqua products - I mean, you really only need black eyeliner and black eyeshadow. I used Stila Ebony for the eyeshadow, and for the eyeliner pencil, I just a random Wet n' Wild i-Shimmer one I had lying around. Turned out, (as you may have guessed from the name), the Wet n' Wild eyeliner had glitter, which made the entire look shimmery black, instead of matte black as I intended. Oops. For the skintone eyeshadow, I used Stila Chinois, a matte eggshell shade. Anyway, if you want to follow the instructions Illamasqua has to re-create the Sophie-I look, they're up on Scrangie'ssite. There's a link to a video tutorial, as well as a step-by-step picture tutorial too, although this tutorial was taken from Source: Nihrida, who also has her version of the look up (and it's hawt on her). I kind of wish I had defined the cut crease a little bit more, but in my eagerness to remove any harsh lines, I think I may have overblended. Also, in the instructions, they recommended that the eyeliner be flicked up, which looked a little over-crowded on my already tiny eyes, so I rubbed it off. Another thing I noticed was that although the instructions given by Illamasqua didn't mention eyeliner on the lower lashline, the model is actually having black eyeliner that's flicked out at the inner corner of the eye. I didn't do this, because it would have been a tad too unwearable for me, but I like how it really looks like in the promo pic. For me, I just smudged some black eyeshadow along my lower lashline, and called it a day. My own apprehensiveness aside, I actually quite liked this look. Sure, it's daring, and I don't think I'd actually dare to wear it out, but it has this certain high fashion, runway-like feel about it. It's the kind of eye look I could imagine models wearing down a runway. 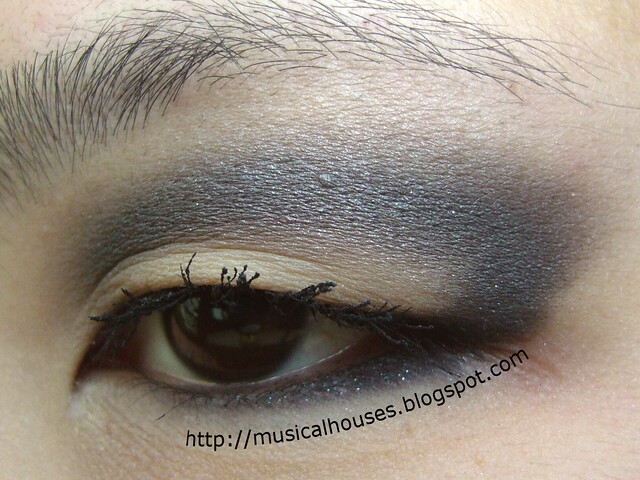 It looks very striking, if nothing else, due to the stark definition created by the black eyeshadow against a pale base. I do quite like the look, it's bold and unique, a very dare-to-be-different look. So anyway, that's my version of the Illamasqua Sophie-I look. RIP Sophie. A life may end, but a strong soul will never be forgotten. That is a very striking look indeed! Not sure if I could pull it off, since I too have lack of space due to Asian eyes but yeah, I think you're right about your photos in that maybe the crease line should be better defined. Anyhow, I'd never heard of this charity until you blogged about it so thank you for raising my awareness of this! This look is very nice! 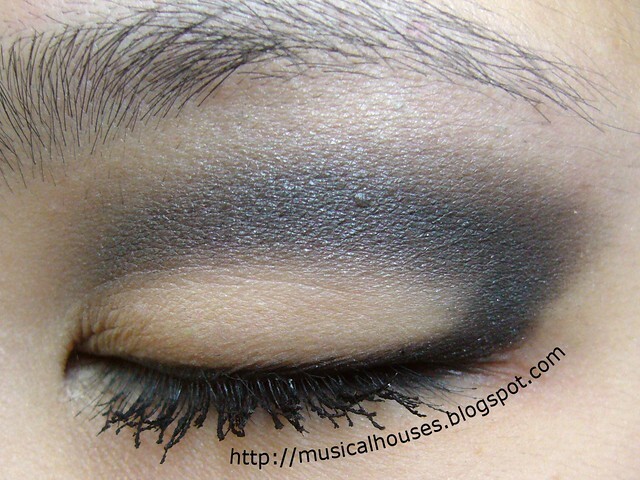 Beautiful on Asian eyes, an artistic smokey eye look. Love it! I am a massive supporter of Sophies Cause and Illamasqua have done a great job with the range. Thank you so much for sharing your take on this look. :D Inspirational to see other eye types can pull it off too. Very nice! I really love this look actually! I think this would be a great night-out look. Great shading. Vanity Trove: A Romantic Gift! Stuff I do when Bored: Pink and Blue Lips! Valentine's Day Nails with Flowers and Gems! Vanity Trove: A Box of Surprises Every Month! Anti-Valentine's Day Nail Art: Shattered Hearts!